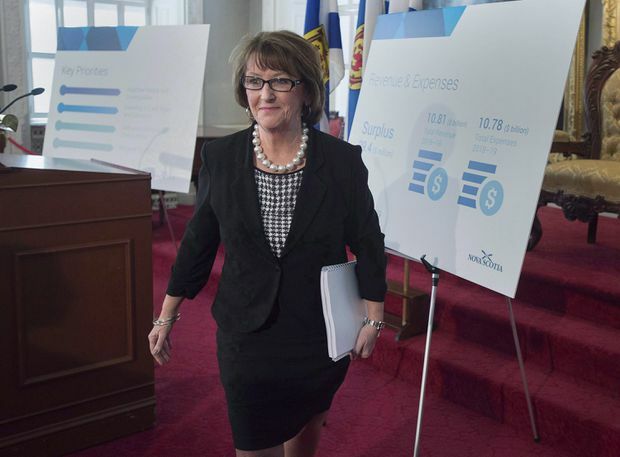 Nova Scotia Finance Minister Karen Casey heads to table the budget after briefing reporters at the legislature in Halifax on March 20, 2018. Nova Scotia’s Liberal government is expecting millions in added federal dollars will help it achieve a balanced budget while it commits money to rebuild aging hospitals and deal with rising pressures in health care. The province is projecting a thin $33.6-million surplus in Tuesday’s fiscal plan for 2019-20, on a budget of $11 billion. It’s the province’s fourth consecutive surplus budget, and there are no increases in taxes or fees. However, the Liberals biggest spending increase is in the health care sector. The government confirmed $157-million in capital grants for “the largest health care redevelopment projects in Nova Scotia history,” at the Queen Elizabeth II Health Centre in Halifax and the Cape Breton Regional Health Centre in Sydney. In addition, the budget for the Nova Scotia Health Authority – the province’s merged health agency – is up $57.2-million. Finance Minister Karen Casey devoted close to a quarter of her speech to the province’s health care system, which has come under continuing criticism for hospital crowding, doctor shortages and high numbers of pressure injuries among nursing home residents. “When we looked at what the needs were and what the province could afford we were certainly identifying health as a priority,” she told reporters just before speaking in the legislature. Casey pointed out the province’s health spending has grown by almost one fifth in five years to $4.6 billion, consuming a steadily rising percentage of the government’s revenues. However, the province’s bottom line is assisted by federal contributions that are expected to go up by $178-million, with health transfer and equalization payments making up about one-third of all its revenues. The transfers, equalization and money for mental health services from Ottawa’s federal Liberal government are all rising, after negotiations earlier this year. It is committing $14.2-million for housing for people with disabilities, with $6.6-million to help pay for care and support of people with complex needs. The budget calls for $3-million to pay for a new venture capital tax credit aimed at encouraging equity investments in Nova Scotia companies. Education funding is up by about $33-million. “By September 2020, we anticipate that every four-year-old in Nova Scotia will have access to a free, pre-primary, early learning opportunity,” said Casey. The minister also noted the funding for cannabis legalization related to the introduction of edibles and concentrates is going up by $1.1-million for a budget of $3.5-million. Those funds will go to public awareness campaigns, staffing and more screening equipment for policing agencies.